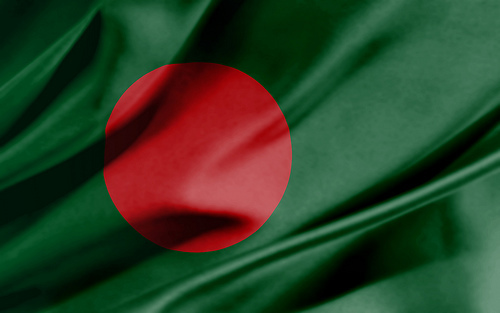 IntLawGrrls: Will tribunal bring Bangladesh justice? 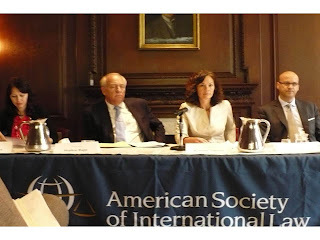 Having outlined the background and nature of the International Criminal Tribunal (ICT) in Bangladesh (flag at right) in yesterday's post, today I will discuss specific concerns raised n the international community, most particularly by nongovernmental organizations such as Human Rights Watch and by Stephen J. Rapp (below, second from left), U.S.Ambassador-at-Large for War Crimes Issues. As a preliminary matter, one must wonder why Rapp and others are so exceptionally concerned with what goes on in Bangladesh’s domestic courts and why the Bangladesh government has shown itself to be at all receptive to outside intervention. However, as Rapp has pointed out, the ICT was established specifically to prosecute international crimes, such as genocide and war crimes, which are crimes defined under international law and recognized as violations of international law. Despite the fact that the ICT proceedings will occur in domestic courts pursuant to domestic statute, there is justifiable interest in seeing that “international law” is followed according to international standards. Since the promulgation of the 1973 Act, there has been considerable development in international criminal law, and much can be gained by looking at other international forums, such as the International Criminal Tribunals for the Former Yugoslavia and for Rwanda, the Special Court of Sierra Leone, and the International Criminal Court. Finally, as a state party since 2000 to the International Covenant on Civil and Political Rights, Bangladesh is obligated at all times to honor the treaty -- most especially when it purports to be enforcing international law. By far, the most troubling concern is that related to the constitutional amendments (Articles 47(3) and 47A), which deny a number of constitutional protections to Bangladesh citizens who are being detained or prosecuted under the ICTA. For example, Article 47(3) prohibits such individuals from challenging any law, including the amendments themselves, on the ground that it is unconstitutional. Article 47A of the Bangladesh Constitution further strips individuals detained or prosecuted under the ICTA of specific constitutional rights that are guaranteed to all other persons in Bangladesh, such as the right to protection of the law (Article 31), protection from ex post facto (retroactive) laws and the right to a speedy and public trial (Article 33), and the ability to enforce guaranteed rights (Article 44). These are fundamental due process rights, and are guaranteed not only in international law, but also to all other suspected criminals in Bangladesh. Withholding such rights from suspected war criminals who have not even been convicted does not engender faith in the fairness of the process or outcome. ► Individuals can be arrested and questioned before formal charges are brought, they can challenge their detention only once, and they have no right of appeal. Currently, at least five individuals have been in detention for over six months, some as long as ten or more months. They can expect no possibility of release until after their trial, given that they have already lost their initial applications for bail. ► The rules also allow for the interrogation of the (informally) accused without counsel present. There is no procedure for informing questioned individuals of their privileges or rights or that they are entitled to counsel. Already, several detainees have been interrogated without counsel present based on the prosecution’s request to the Tribunal. During the interrogations, which lasted all day, the detainees were denied the opportunity to have private conversations with their counsel during breaks, and were prohibited from discussing the interrogations with counsel altogether. ► There has been no investigation into claims of torture and abuse of individuals in detention. ► There is no procedure for challenging the jurisdiction of the Tribunal or making constitutional challenges to the ICTA or Rules of Procedure. ► There is no requirement that the prosecution disclose exculpatory evidence (“unused evidence”) to defendants or their counsel, nor are there any provisions that enable a defendant to request discovery. Additionally, the prosecution is only required to disclose the evidence upon which it will rely three weeks in advance of the trial to the Tribunal; rules do not specifically require disclosure to defendants or their counsel. ► Though the burden of proof is on the prosecution, there is no presumption of innocence. Additionally, the burden of proof is reversed to the defendant in an alibi defense. It could be argued that some of these inadequacies, standing alone, are not enough to evince a lack of due process. However, allowing all of them in the same proceeding -- especially when considered together with the constitutional amendments, which deny fundamental protections to the defendants --the ICT, as it now stands, falls far short of the international standards of due process that are evident in the rules and procedures in the ICTY, ITCR, and the ICC. Moreover, the ICT rules and procedures, together with the constitutional amendments, clearly violate the guarantees under Article 14 of the ICCPR. In short, Bangladesh would be violating its international law obligations were the ICT to proceed without modification. There is no appellate chamber within the ICT, and the Rules of Procedure only allow for appeal on matters of law to the Appellate Division of the Supreme Court -- after the conviction of an accused. No procedures allow both parties to file motions for appropriate rulings and relief and to seek interlocutory appeal of key adverse decisions. Allowing parties to appeal decisions on evidence and other significant issues during the course of the trial, particularly given the complexity of international crimes, is more efficient and fair, and avoids waiting until an acquittal or conviction in the event error occurs during trial. While an estimated 1,600 people took part in the atrocities, it is clear that the Tribunal will not be prosecuting soldiers in the Pakistani army or the Bengali freedom fighters. Instead, the government appears to be targeting only Bangladesh citizens accused of collaborating with West Pakistan and committing certain crimes. Five of the seven alleged collaborators are members of the Jamaat-e-Islami party, Bangladesh’s biggest Islamic party and a partner in the main opposition alliance against the party now in control, the Awami League. The other two accused are from another opposition group, the Bangladesh National Party. This has led to criticism that the Tribunal is merely a vehicle to repress political opposition. To exacerbate the problem, there is no process in the ICTA or Rules of Procedure to challenge the Tribunal judges. Equality of arms is a fundamental component of a fair trial, as every party must have the opportunity to present its case under conditions that do not place either party at a substantial disadvantage. The Tribunal could enhance both the fairness of the process and the perception of fairness by establishing a Defense Office, which could play an important role in protecting the rights of the accused by ensuring that defense counsel have adequate support to prepare and present cases and by providing training on investigative techniques and access to jurisprudence and developments in international criminal law. Further, a Defense Office could maintain a list of qualified lawyers who can be assigned in the event that a defendant cannot afford legal counsel. Cases involving allegations of war crimes, crimes against humanity, and genocide are already complex, and the crimes here date back decades. It is important for a fair and just outcome that the attorneys for both sides have the knowledge, the expertise, and the ability to effectively bring their case or defend their clients. The ICTA does not contain any provisions for the protection of witnesses whose testimony may be necessary in the trials. It is the experience of other international crimes tribunals, particularly those involving war crimes and genocide, that witnesses have legitimate concerns about being subjected to intimidation, threats, and actual violence -- concerns that may keep them from testifying. The ability to ensure the attendance and safety of witnesses is an essential component of a successfully functioning tribunal process. Accordingly, at a minimum, there should be resources and a process in place to protect witnesses, victims and family members before, during, and after court appearances, and to provide secure transportation to and from the court, as well as address the protection of personal information in a manner that will not deny the right of defendants to see the evidence against them. During the discussion, Rapp made clear that he would be returning to Bangladesh to continue his involvement and to provide assistance to the ICT. Interestingly, at the end of the briefing, Bangladesh’s top diplomat to the United States, Ambassador Akramul Qader, passionately defended the Bangladesh justice system and Parliament. He took the opportunity to point out that nobody on the ASIL panel was from Bangladesh, resulting in a “one side of the fence” discussion. Perhaps mirroring the political tension in Dhaka over the ICT, several Bangladesh citizens were quick to respond. but conceded that the Rules of Procedure may not be up to international standards yet. ► Change the bail scheme and strong likelihood of indefinite detention, by requiring the release on conditional bail of an accused who has been detained for more than a year pending investigation of offenses. In exceptional circumstances, detention may be extended for a further period of six months. ►Allow counsel of an accused to be present if the accused is making a confessional statement. Counsel would still be prohibited from participating, making statements, or engaging in conversation with his or client during the interrogation. ► Allow both defense and prosecution to request the Tribunal to review any orders issued. Even with the changes, there is still no review of pre-conviction orders from an appellate court,nor the ability to challenge the jurisdiction of the Tribunal. ► Explicitly state that a defendant is presumed innocent until found guilty, that the prosecution must prove its case beyond reasonable doubt, and that the mere failure by the defense to prove a plea of alibi does not render the defendant guilty. The new rules also give more power to the tribunal to ensure the protection of witnesses and victims, such as regarding security during transportation and accommodations. Most significantly, defendants are still denied their full rights under the constitution by way of a constitutional amendment. Moreover, there is no reference to the possibility of using the ICC as a guide either procedurally or substantively, an addition that Rapp maintained could help resolve many concerns without requiring an overhaul of the applicable laws, including the Bangladesh Constitution, and rules entirely. It remains to be seen whether justice for international crimes will finally prevail in Bangladesh.